24 mm diameter Pink Glitter Paw Print, Pet Tag with an exceptionally hard wearing clear epoxy coating to protect the glitter face. These tags feature a shiny silver (nickel) finish to the front and sides and are highly polished nickel back. 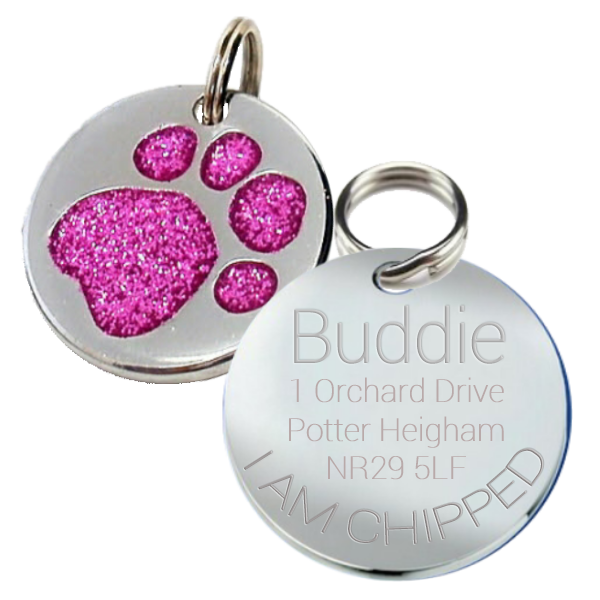 These Round Glitter Paw Tags come complete with a 16 mm split ring, and the back of the Tag can be engraved with your details FREE - Please read engraving information below before purchasing. Recommended engraving is 5 Lines Of 15 Characters per line - Name, Phone Number, and shortened Address (House Number, Road and Postcode) is recommended, but the choice is yours.